The Ryobi 12-inch Electric Snow Shovel is engineered to remove snow quickly from patios, decks and driveways. With a powerful 10 Amp motor, this electric snow shovel provides consistent power that efficiently discharges snow up to 25 ft. With the convenience of instant starting and quiet operation you can remove snow hassle-free at any time of day. The compact design and large handle make it easy to control and ideal for clearing areas larger snow blowers cant reach. The Ryobi 12-inch Electric Snow Shovel is backed with the Ryobi 5-Year Limited Warranty. 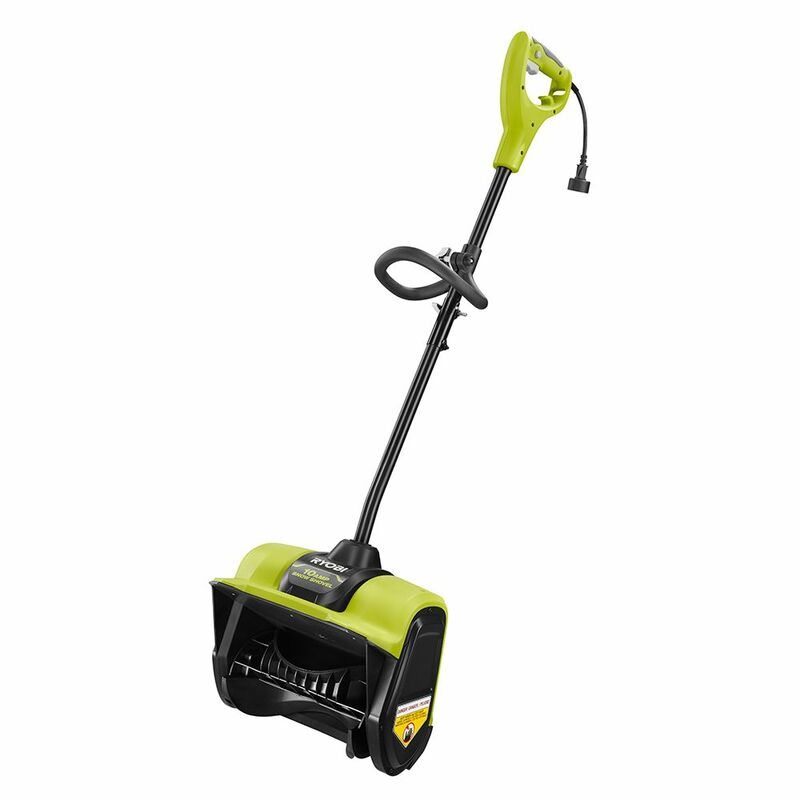 10 Amp 12-inch Electric Snow Shovel The Ryobi 12-inch Electric Snow Shovel is engineered to remove snow quickly from patios, decks and driveways. With a powerful 10 Amp motor, this electric snow shovel provides consistent power that efficiently discharges snow up to 25 ft. With the convenience of instant starting and quiet operation you can remove snow hassle-free at any time of day. The compact design and large handle make it easy to control and ideal for clearing areas larger snow blowers cant reach. The Ryobi 12-inch Electric Snow Shovel is backed with the Ryobi 5-Year Limited Warranty. 10 Amp 12-inch Electric Snow Shovel is rated 4.3 out of 5 by 35. Rated 5 out of 5 by Jorn from Great power This electric shovel is so powerful! It launches snow across a 4 lane road. The only issue is the lack of control of snow blasting. The snow might cover your neighborhood's house as it removes snow amazingly. Rated 5 out of 5 by Tiner from Powerful little machine! We have had a few, back-to-back snowstorms in the previous weeks, and f... Powerful little machine! We have had a few, back-to-back snowstorms in the previous weeks, and found this gadget to suite our needs very well. Rated 5 out of 5 by beach girl from Powerful Snow Shovel Our little red Toro, tanked, and we needed to replace it. We could have repurchased the same one, but it wasn't as powerful as this one, and was more expensive, and the warranty on the Ryobi was better so we went for it. Great power throws a lot of snow, we clear two long paths, and two parking spaces and a large deck. Does the job with ease ! Rated 2 out of 5 by Sweet p from Ready for winter! I have used my snow shovel a few times now and so far so good! It does take some getting use to pushing it and manage the switches at the same time. With mounds of snow, I found it better to do it in layers rather than attack it all in one go. Can't say I'm looking forward to snow in the future but at least I feel ready for it!!!! Rated 5 out of 5 by Garre70 from Great tool for decks and sidewalks I bought it in February and it is excellent. Cleaned pathways on my deck and sidewalk. Much easier and faster than using my big snowblower in confined space.